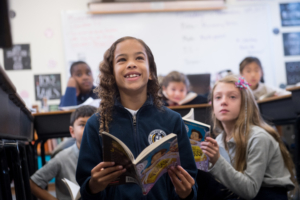 Our Lower School, from junior kindergarten through 5th-grade, creates the perfect foundation for later success. We use curriculum and best practices that reinforce key concepts. Our teachers have freedom to use a variety of resources to supplement learning in their respective classrooms. Our small class sizes provide the perfect opportunity for teachers to tailor their approach so that each student grows academically and spiritually, and has fun while actively learning. What can you expect in Lower School? Traditional events including Bingo, Grandparent’s Day, Donuts with Dad, and more!